Allen & Hoshall prepared the documents required for each program and is assisting the city in their implementation. The Order on Consent also includes a Continuing Sewer Assessment Program (CSAP) of the Wastewater Collection and Transmission System (WCTS) as required by the EPA Administrative Order on Consent. The CSAP entails continual assessment of the WCTS as required in the Administrative Order on Consent and in accordance with the Owner’s Continuing Sewer Assessment Program as approved by EPA. The CSAP provides a framework to assess and analyze the infrastructure of the WCTS, including the establishment of procedures for setting priorities and schedules to complete those assessment activities. Data collected relative to the WCTS while undertaking the CSAP will be used in subsequent prioritization decisions as to which portions of the WCTS require repairs and which portions of the WCTS will be assessed in following years. In accordance with the EPA Administrative Order on Consent, approximately 10% of the WCTS will be assessed on an annual basis over a 10-year period. 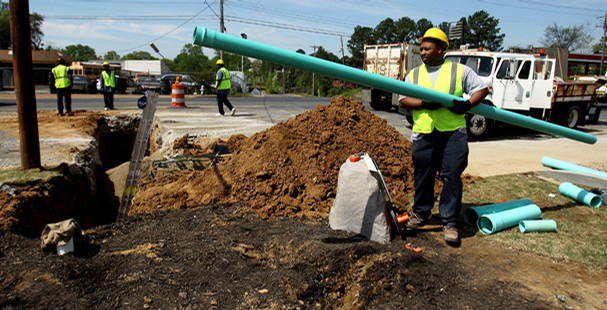 To put the framework of the CSAP into effect, A&H has developed specifications and contract documents to utilize CCTV, sonar, smoke testing, dye water flooding, along with other available technologies to perform the field assessment of Vicksburg’s sewer system assets. Once the City has procured the services of a contract assessment firm, A&H performs oversight and field inspection services during the term of the contract. Subsequent to the completion of each annual assessment of portions of the WCTS, design documents will be prepared to address any problems and other repairs to items in the WCTS including gravity sewers, force mains, pump stations, manholes and other appurtenances. Allen & Hoshall also is providing design, construction administration and inspection services for the installation of emergency generators and quick connections for the WCTS. In addition to these services, Allen & Hoshall is providing GIS Mapping Services for the City of Vicksburg to assist the city in their compliance with an ongoing EPA Order on Consent related to their sanitary sewer system. The project involves verifying and updating the city’s antiquated mapping system from maps based on aerial photography to a mapping system based in GIS related data. The city’s sewer system contains approximately 192 miles of gravity sewers, force mains, 41 pump stations and related appurtenances. The mapping data is also being updated in conjunction with the city’s ongoing Continuing Sewer Assessment Program in accordance with the EPA Order on Consent.